A simple blueberry cocktail that really lets the blueberry flavor shine through. 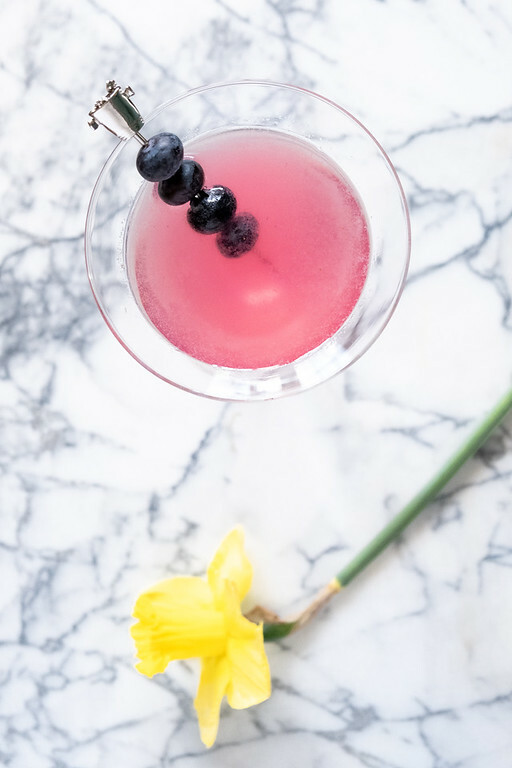 When you combine an elderflower martini and a blueberry martini, you end up with this delicious and fruity blueberry elderflower martini featuring gin, elderflower liqueur, blueberries and lime juice. Who else loves it when organic blueberries go on sale? They start going on sale at Whole Foods and Earth Fare right about now. That keeps me in blueberries until my own blueberry bushes start producing. There are lots of ways to eat blueberries, but I also like to drink them. Sure they are great in smoothies, but they are also amazing in blueberry cocktails. Step 1 – gather your ingredients: fresh squeezed lime juice, gin, elderflower liqueur and blueberries. Step 3 – in a cocktail shaker, muddle the gin and the blueberries. Step 4 – add lime juice and Elderflower liqueur to cocktail shaker. Step 5 – Add ice to cocktail shaker and shake for 15-20 seconds. Empty ice from martini glass and strain cocktail through a fine mesh strainer into glass. Serve garnished with blueberries. Tips for cocktail making: Always use fresh squeezed lime juice. We tend to squeeze enough on the weekends to last us all week for cocktails. A fine mesh strainer keeps your cocktail clear and strains out any blueberry skins and pulp. What is Elderflower Liqueur? How to Make Homemade Elderflower LiqueurIf you’ve never tried Elderflower Liqueur, you are in for real treat. It is made from elderflowers, which are small white flowers. The liqueur has a lovely floral flavor – not overpowering at all. I love what it brings to cocktails. You can actually make your own homemade elderflower liqueur – . 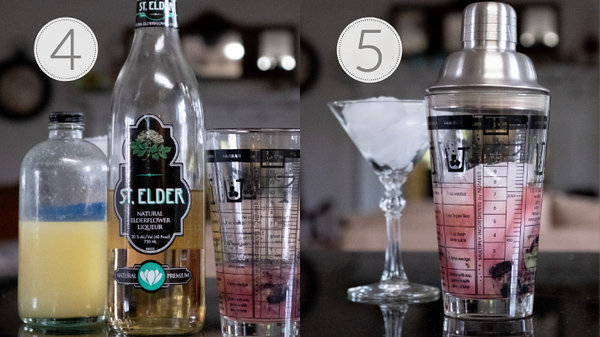 The combination of blueberries, elderflower liqueur and my liquor of choice – gin – is amazing! Fruity and refreshing! Just look at that color! This would be a great Easter Cocktail, so colorful, it would also make a great Mother’s Day Cocktail. Of course, I think it makes a great Tuesday cocktail too! If you’d love to get an update whenever I post a new cocktail, be sure and sign up for my email list. You don’t get bombarded with chatty emails, you just get a notice whenever a new post goes live. You can even choose to only sign up for cocktails! Sign up here. 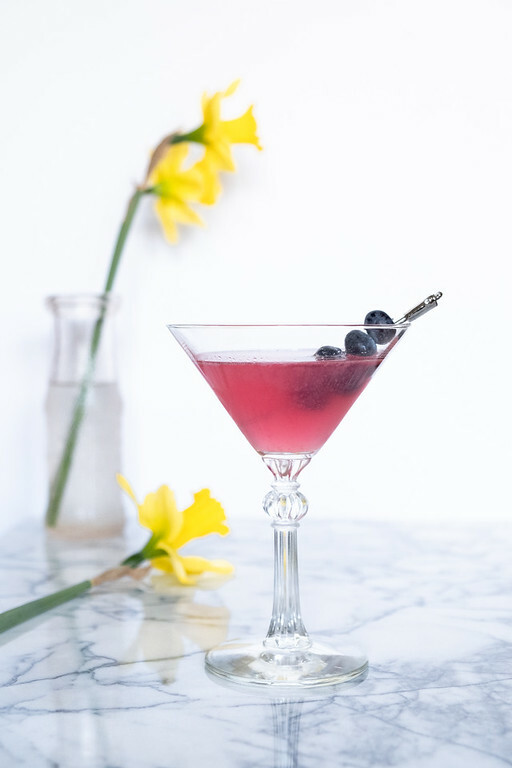 This Blueberry Elderflower Martini is a simple blueberry cocktails featuring fresh blueberries, gin and elderflower liqueur. Fruity and floral and easy enough for a weeknight, but pretty enough for a special occasion. 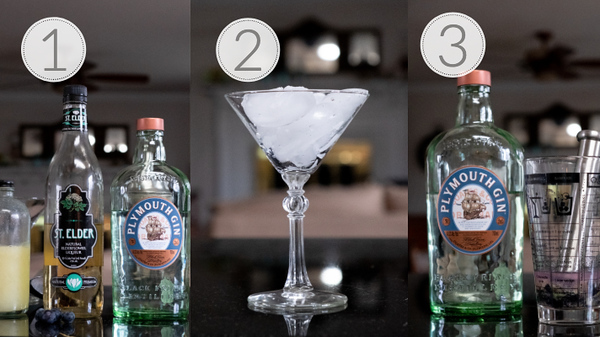 Add ice to martini glass to chill. Place gin and blueberries in the bottom of a cocktail shaker. Muddle the blueberries and the gin. Add the rest of the ingredients and fill the shaker half way with ice. Shake for 15-20 seconds. Dump out the ice from the martini glass. Strain into a martini glass - a fine mesh strainer gets rid of the blueberry pieces. Always use fresh squeezed lime juice. We tend to squeeze enough on the weekends to last us all week for cocktails. A fine mesh strainer keeps your cocktail clear and strains out any blueberry skins and pulp. Your drinks always look incredible! What a fancy drink. Can’t wait to try it. I love all things blueberry. I would like this cocktail.